From the initial moment that the first scrolls were said to have been found in a certain, cylindrically-shaped jar in Cave 1, it was assumed that those hitherto unknown jars were manufactured specifically to store scrolls. Even though the original excavator consistently called the jars “cylindrical jars,” scholars preferred to utilize the term “scroll jars” whenever a new jar of this type was found. The facts, however, show that the jars were not all intended for carrying scrolls. This is clear from the fact that most of these jars were not found with scrolls in them and very few scrolls that were discovered were actually found in jars. 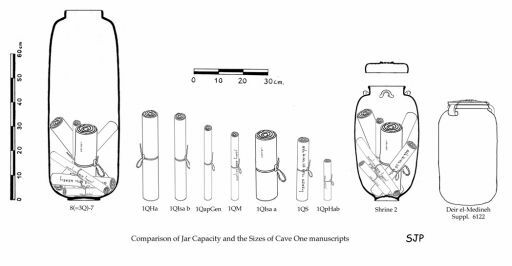 Also, most caves which contained cylindrical jars or their lids had no trace of even a single manuscript inside the cave (e.g., GQ1–3, 7, 10, 12, 15, 17–18, 21, 22, 28–32, 39, 40; PQ13, PQ24). 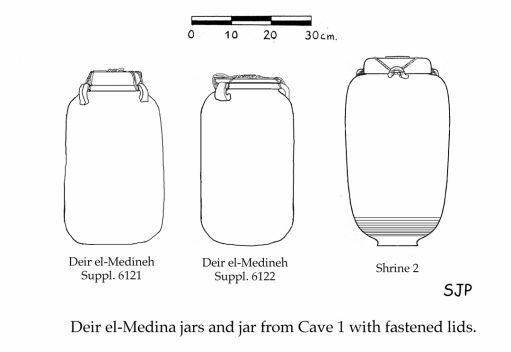 It also has been assumed that these jars were manufactured at Qumran. 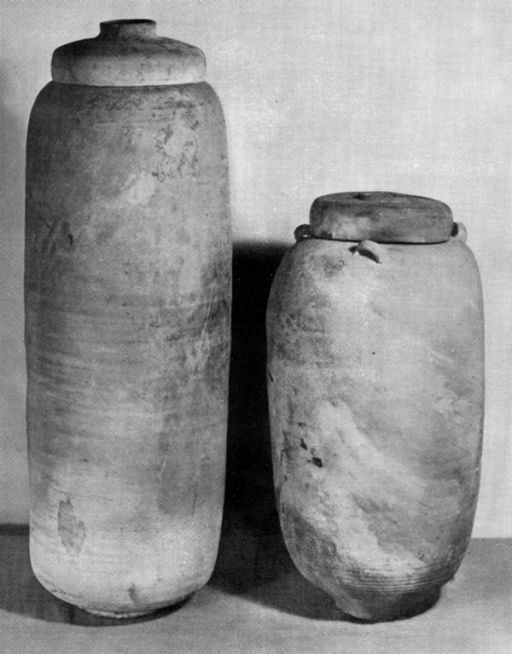 However, after recent chemical analyses of the cylindrical jars by Gunneweg and Bala, it was concluded that at least 75% of the cylindrical jars from the caves, and more than 50% of those from the site of Qumran were derived from the Jerusalem area, having been made from clay from the Jerusalem/Motsa flow. The remainder were proven to derive primarily from the regions of Qumran and Jericho and were further distinguished by detectable variations in form, color and manufacture. Those in the caves which derived from Jerusalem were often accompanied by lamps or domestic wares dating to the second half of the first century CE, indicating that they were most likely hidden there during the period of the First Revolt. It appears likely that only the shorter jars with handles were used for archival purposes specifically for the storage of legal and personal papyrus documents and letters (and not normally literary scrolls). The handles were actually used as anchors for tying down the lid; parallels of such practices have been found in Egypt. However, the scrolls of an active community library were not placed in archive jars for extended periods of time but were normally stored on shelves inset into the walls of a room (compare, e.g., the Celsus library at Ephesus, the library at Nizanna, and, apparently, Qumran loc. 2). The only reason the contents of a library might be found in a cave, whether in jars or not, would be to set aside worn or damaged scrolls in a geniza or to temporarily hide the scrolls from imminent danger. If the latter case is true for the cliffs of Qumran, those who hid them did not survive to retrieve them according to plan. S. Pfann, ‘Qumran’, Encyclopedia Judaica (New York: Keter and Macmillan Publishers, 2006).